ANY LONG TERM RENTALS?? HUSBAND AND WIFE NONSMOKERS,NO KIDS. PLEASE CALL OR EMAIL,THANKS!! Looking for 2 bedroom annual rental. Very neat,quiet,clean. Can do my own yard maintenance. Small dog and cat. Don & Jan are looking to rent for the 2016 season. Love this park. Interested in buying a mobile home in this park. 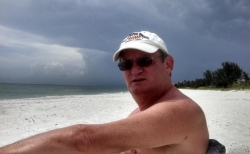 Give me a call 239-440-7663 or email me. Looking to buy a new or used mobile home in this park. Is this also a used Car Lot? I see a lot of Junk Cars for sale there. 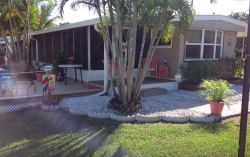 $32k will get you this 12x60 2BR 1 Dbl shower on a corner lot loaded with beautiful palm trees and a new deck! This mobile home will become available the week of 9/28. 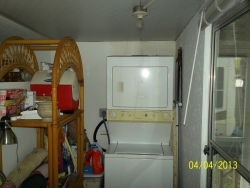 Call Phyllis for details 317 417 2297.
looking in your area to purchase a mobile home, are cats ok. What are the lot fees. looking for rental for jan/feb/march 2014 we were visiting in park last year and seeking rental perf. 2 bd. Would like to rent mid-march to mid-april 2015, we have spent the winter in your park 4 years ago in a fifth wheel, hope to hear from someone. 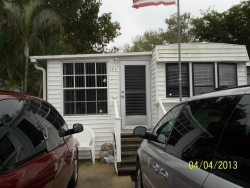 We are looking to rent a 2-bedroom unit for one week (March 30th through April 6th, 2014). My husband and I are traveling with another couple to Fort Myers to visit our daughter who lives off of Iona. We are all over 55. Thank you!